Browse > Home / Featured Articles / Deconstructing the Oslo Accords 25 years later: Was it a gift or a curse? It’s hard to believe that it’s been a quarter of a century: Sept. 13 marks the 25th anniversary of the 1993 signing of the U.S.-brokered Declaration of Principles between Israel and the Palestine Liberation Organisation. Israeli Prime Minister Yitzhak Rabin, U.S. President Bill Clinton and Palestine Liberation Organization head Yasser Arafat at the signing of the Oslo Accords on Sept. 13, 1993. Credit: Vince Musi/The White House. 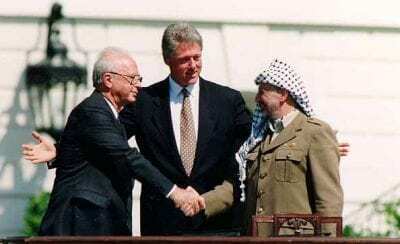 Known also as the Oslo Accords, the deal signed between Israeli Prime Minister Yitzchak Rabin and PLO head Yasser Arafat recognised the PLO as the official representative of the Palestinian people. With peace between the two sides the ultimate goal, Israel gradually handed over the governing and security functions of life for the Arabs in Judea, Samaria and Gaza to the newly formed Palestinian Authority, or P.A. Although the accords themselves didn’t call for the creation of an official Palestinian state west of the Jordan River, subsequent Israeli proposals over the years did, in fact, allow for such an entity to come into being. All of those offers, however, were rejected by the P.A. leadership. The accords were meant to foster peace, but that didn’t turn out to be the case at all. According to the Israel Government Press office, more Israelis were murdered by Palestinian terrorists in the five years following the first Oslo agreement than in the preceding 15 years. In addition, according to statistics provided by the online Jewish Virtual Library, more than 1,600 Israel civilians and soldiers were killed from the accords’ signing until now. Many wonder if the Oslo Accords are still alive, or have they been cast into the dustbin of history? JNS spoke to five leaders from all walks of life within Israel and the P.A. to get their take on where the situation stands between Israelis and Palestinians 25 years after those well-documented handshakes on the White House lawn. 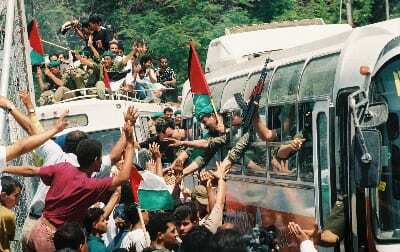 Palestinian police celebrate on their entrance to the city of Jericho, Friday May 13 1994. It was one of the first cities handed over to Palestinian Authority control in 1994, in accordance with the Oslo Accords. Credit: Photo by Yossi Zamir/Flash90. So while Edelstein says Oslo is dead, he remains optimistic in the long term. Zionist Union Party MK Nachman Shai, who serves as the Deputy Speaker of the Knesset from the opposition, says that under Oslo things got “better and worse.” Better, he says, because “it created a framework and helped Israelis finally accept the paradigm of ‘two-states for two people.” He added that it also was an opportunity for the Palestinians to compromise. Professor Khalil Shikaki is the well-respected director of the Palestinian Center for Policy and Survey Research, based in Ramallah. His center releases in-depth studies on a regular basis about Palestinian attitudes, including their thoughts on peace with Israel. Shikaki says that Israel shares most of the blame for Oslo’s failure by not fulfilling its obligations under the agreement. “Israel did not transfer areas to the P.A. in accordance with Oslo.” He adds that “Israel continued to build settlements and failed to negotiate permanent status issues in accordance with the agreement.” As a result, he says that “the interim nature of Oslo became permanent,” while agreements on those final-status issues were postponed. Shikaki’s most recent research shows that the Palestinians also feel that Oslo is finished. He says that 2/3 of Palestinians say the P.A. should dismantle Oslo and instead create a sovereign entity without an agreement. A frightening statistic he says also reveals that while the majority of Palestinians don’t support the use of violence at this juncture against Israel to achieve statehood, he says that number is increasing. “We are getting close,” he says, to a majority that favors violence. He adds that Israel needs to destroy the terror organizations that seek to annihilate Israeli Jews, while at the same time help implement a new educational curriculum for the next generation of Palestinian children—one that doesn’t call for the destruction of Israel. Yariv Oppenheimer is the former director of the left-wing Peace Now organization and currently an active board member of that group. He says that groups like Hamas and the Israeli right-wing were the ones fighting Oslo, both through democratic means and through non-democratic ones, citing the murder of Rabin and the killing spree carried out by Israeli Baruch Goldstein, which claimed the lives of 29 Palestinians. A few years later both these West Asian leaders were murdered. Rabin by a fundamentalist Jewish fanatic and Arafat likely by poison, but the killer (s) have not been determined to this day.